1. Can you tell us a little bit about your Delegation? Francey: We’re actually a part of two Delegations. One is a collaboration between City Sprouts—we’re a non profit that works in partnership with public schools to maintain and support teachers’ use of gardens–and the Peabody School. 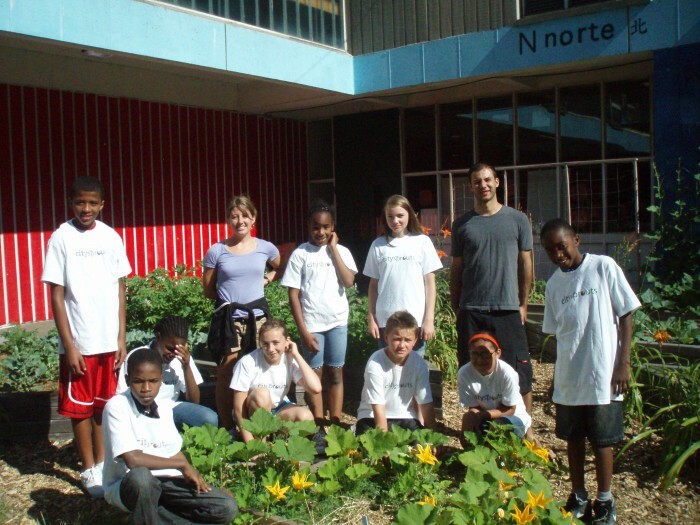 The other is a partnership between City Sprouts and the Gately Community Center. At Gately there is a student group called the Apple Co-op. They buy apples in bulk and sell them to after-school programs. The students are part of marketing and operations, and they deliver the apples. Students from Gately will be team leaders. 2. What made you decide to become a Tree Planting Delegation? Francey: City Sprouts has been wanting to plant apple trees and this opportunity is even better. We’ll get to take part in a movement that will reach far beyond our school, far beyond Cambridge. Apples have meant a lot to our students. Every fall we make apple cider in the garden and teachers include the activity in their lesson plans–making math connections, working on literacy, even studying simple machine units. Now they’ll be able to learn directly where apples come from. Kenya: City Sprouts approached us and we were excited. We thought it was in tune with what we have been doing with the Apple Co-op, a great way to tie into the project. It was a no-brainer. 3. What does participating in the Boston Tree Party mean to you? Francey: The Boston Tree Party is such an amazing synthesis of community organizing, food education, and environmental literacy. It’ll help people learn about where our food comes from and how it affects individuals and communities. It will also help us make connections to history, something relevant now as we face rising commodity prices, food safety issues, and food shortages. This movement will also allow our students and families to connect to the local history of apple trees and the Boston Tea Party. Kenya: We’re excited to connect with other communities outside of Cambridge. We like that this project is long term and in season. And we’re excited to learn more about tree care. 4. What does planting heirloom apples mean to you? Francey: Heirloom apples are a direct connection to the past. As a child I didn’t always understand the point of history, but in a lot of ways, agriculture has given me a reason to understand why history is so important. Thinking about the multitude of ways to grow our food, looking at all the different breeds of plants that have their own histories, and that have been passed down through families… Heirloom fruit give character and value to our heritage and taste buds. Kenya: It’s great for the kids to learn about heirloom apples. We usually work with a few kinds of apples from farms. This experience will be more connected – they’ll be able to see where apples come from, the planting process, and they’ll get to participate in something that will be there forever. 5.What kinds of activities will you be doing at your Tree Planting Party? Francey: The tree planting party will be up to the kids to organize and design. They can decide how they want to celebrate! They’ll have the most creative ideas. Kenya: For Valentines day we were thinking of coming up with different apple products to showcase at our tree planting party. Cider or applesauce, apple butter–all the products that we can make from apples. We were thinking about asking the question: what can you do with apples in your family? We were also thinking of making things that are in the shape of apples, like jewelry boxes. 6. What’s your favorite kind of apple? Kenya: Granny smith and tart apples, definitely.